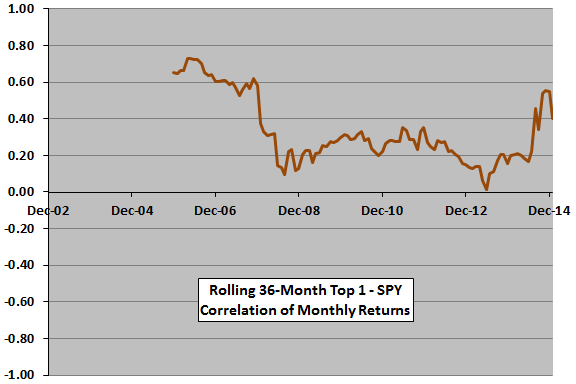 During January 2003 through January 2015, the correlation of monthly returns between Top 1 and SPY (VBINX) is 0.29 (0.33). These correlations are not high, but nor are they indicative of perfect diversifiers. Over the subperiod since August 2006 (when the momentum strategy can use all ETFs), the correlation of monthly returns between Top 1 and SPY (VBINX ) is 0.22 (0.26), between EW Top 2 and SPY (VBINX) is 0.31 (0.34) and between EW Top 3 and SPY (VBINX) is 0.44 (0.47). Further tests focus on Top 1 since it has the lowest correlations with SPY and VBINX. EW Top 1 / SPY each month allocates half of funds to Top 1 and half to SPY. 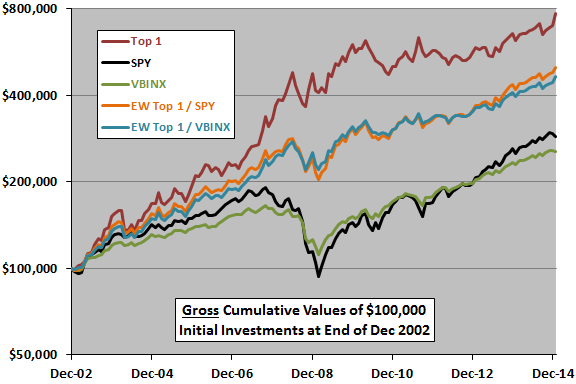 EW Top 1 / VBINX each month allocates half of funds to Top 1 and half to VBINX. Both combinations boost rough Sharpe ratio (average monthly return divided by standard deviation of monthly returns) compared to components. The Sharpe ratio metric arguably penalizes Top 1 for upside volatility. Both combinations suppress maximum (peak-to-trough) drawdown compared to SPY and VBINX, but not compared to Top 1. Top 1 easily outperforms the combinations based on terminal value. Applying a 0.25% trading friction per switch changes Top 1 average monthly return to 1.47%, terminal value to $664,432 and maximum drawdown to -25%. Applying strict monthly rebalancing frictions to EW Top 1 / SPY and EW Top 1 / VBINX would lower their performances materially. For another perspective, we look at cumulative performances. The following chart compares on a logarithmic scale the trajectories of $100,000 investments at the end of December 2002 in each of the above five portfolios. Results show that the combination portfolios generate fairly steady gains except during the 2008 financial crisis. Are Top 1 diversification effects relative to SPY consistent over time? The final chart tracks the rolling 36-month correlation of monthly returns between Top 1 and SPY over the available sample period. Results show that correlation varies considerably (highest when U.S. stocks are persistently the momentum winner, and generally lower after more ETFs are available to the momentum strategy), but is beneficial during the 2008 financial crisis. It may be that the multi-asset class momentum strategy would more effectively and consistently diversify a multi-asset class value strategy (perhaps characterized as an income strategy). However, no such fund has a long enough history for useful testing. In summary, evidence from available data suggest that the Simple Asset Class ETF Momentum Strategy offers some diversification benefits in combination with SPY or VBINX. Most of the above findings are gross, not net. As noted, including switching frictions for the momentum strategy and rebalancing frictions for the combination strategies would lower performance statistics and may affect findings. As noted, the momentum strategy may be a better diversifier of a strategy that picks from multiple asset classes based on value than it is for SPY and VBINX (see “Combining Value and Momentum Across Asset Classes” and “Combined Value-Momentum Tactical Asset Class Allocation”).